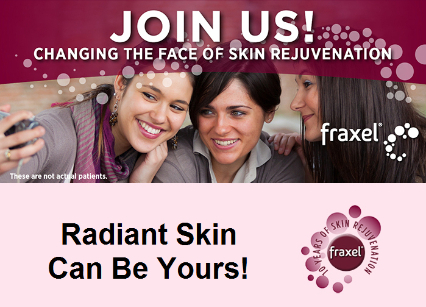 FABULOUS FALL FRAXEL EVENT ONE DAY ONLY! Special offers available only on the day of the event. With a purchase of one of the Multi Therapy systems, you will receive a Micro-Pen treatment 50% off. Enjoy light refreshments & enter to win a Latisse 3ml, a ZO Anti-Aging Skin Favorites Kit, a ZO “Lunchtime Peel” or 50 units of Botox at each presentation time. Bring a new friend and receive an additional entry into the raffle. *All 50 units must be used at time of visit. *Can pre-purchase up to 3 syringes. Monday October 12th – Friday October 16th. *May pre-purchase via telephone with credit card. Products will be available on patient’s account and must be used by April 30th, 2016. Offers may not be combined with any other discounts, incentives or promotions. Patients must be candidates for service, procedure or product as determined by Dr. Parker and/or Medical Spa Professional.